Sai Baba: Heaven is not refused to those who drink tea! A rajasic person is rendered hyperactive by tea, but to an invalid it is a welcome lift. But do not adore tea as the only reality. Now with regard to these habits that have gripped you, there are two methods by which you can discard them. The first is deprivation, denial. This can yield only temporary success. When one's determination relaxes, the habit reasserts itself and it becomes difficult to resist. The second method is to become so absorbed in something far more pleasing that the habit falls off by itself. Remember, what is transient is not important. What is important is eternal. My prescriptions are varied; they differ from person to person, from stage to stage, even in the case of the same person. All prescriptions work. 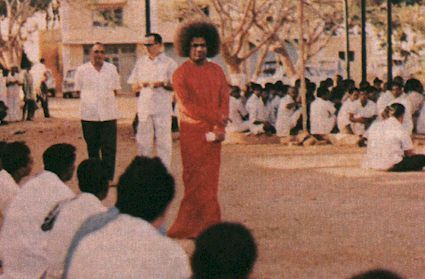 Let people come to me through Bhajan, through Japa, through Meditation, through Mantras, through Tantra or Seva ? as I ordain. Every one will come to me; everyone has to come to me. There are no exceptions.